Lestat may soon be back on our theater screens, as the fourth in Anne Rice's 'The Vampire Chronicles' goes into development. There's a prospective release date of 2015 for 'The Tale of the Body Thief' film. 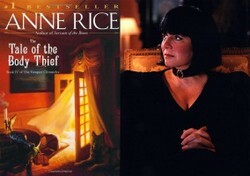 Anne Rice has sold the rights to a production company and the movie project is listed on IMDb. It's happening. 'Interview with the Vampire' has already been given the Hollywood treatment. 'The Vampire Lestat' and 'Queen of the Damned' were merged together in a more controversial movie. Now one of fiction's most famous vampires could soon be back in on the silver screen. Should we be ecstatic or scared? This is the fourth installment in Anne Rice's 'The Vampire Chronicles'. It follows Lestat's on-going pursuit of reason and peace of mind in a dark, vampiric world. The latest Lestat movie could well be with us in 2015, but there's a long way to go before that's a certainty. As early as 2007, there were rumors of Hollywood looking to make this movie. It was only a matter of time. The previous three books were already available to buy on DVD. 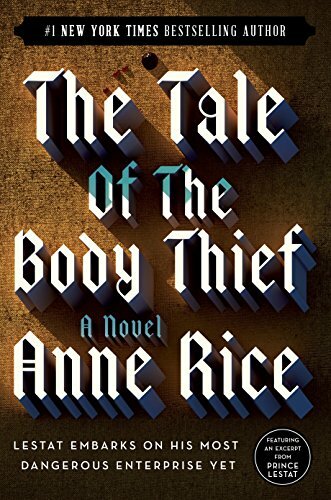 The movie adaptation of The Tale of the Body Thief has finally been given the green light. Ron Howard and Brian Grazer's company Imagine Entertainment have bought the rights. They are the people behind The Da Vinci Code, Flightplan, A Beautiful Mind and Katy Perry: Part of Me, amongst many others. However excitement will be tempered with dismay for Anne Rice fans, when it's noted that she will not be writing the screenplay. That job has been handed to Lee Patterson, of the Imagine Reliance Writers Lab. It's hardly surprising in context though. In 2010, Imagine Entertainment joined forces with Reliance Big Entertainment to launch their screen-writing subsidiary. They employ ten writers to create all of their scripts, in order to cut down the time spent in 'development Hell'. Patterson's screenplay will be refined by Alex Kurtzman and Roberto Orci. They are the writer-producer team, who were responsible for The Transformers and Star Trek movies. They also created the television show Fringe. The silver lining here is that The Tale of the Body Thief is almost guaranteed to be filmed. Ron Howard revealed at the launch of the writers' lab that he'd be cutting down on buying rights for movies, which wouldn't be made. However, at the time of writing, only the film's executive team has been put into place. Ron Howard will direct. Karen Kehala-Sherwood and Erica Huggins, from Imagine, are the executive producers. The movie is not yet linked with any studio and we're a long way from casting. Who Should Play Lestat in The Tale of the Body Thief Film? Tom Cruise and Stuart Townsend have already shown us their versions. Let's have a little fun with our Lestat wish list/speculations. Please back away now if you want no spoilers for the first three novels in the series. But I won't spoil number four. Lestat is not known for his subtlety. When he gets an idea into his head, he pushes the experience to its outer extremes. Centuries of hibernation, following the hurt of Louis and Claudia, were followed by him catapulted into international stardom as a rock star. He's now become all that a vampire could possibly be. Drinking deeply from Akasha, the Queen of the Damned, made him one of the most powerful blood-suckers on the planet. How could Lestat possibly pendulum over to the other extreme from that? Easy! He wants to become human and he has the means to sample that delight too. Out in the swamplands of New Orleans, a serial killer is on the prowl. Lestat sees it as his public duty to take the evil-doer down. But along the way he encounters an even more enticing prospect. A psychic human being with the ability to astrally project all that he is from his own body. Lestat can do that too. So what if they just swopped bodies? After all, it's Lestat's contention that every human wishes to be a vampire and every vampire desires to be a human. The arrangement wouldn't have to be permanent. Just a few hours to see if the grass really is greener on the other side. There's a certain sense of inevitability about what happens next. Anyone with an ounce of common sense could see that the beautiful, enigmatic Raglan James would have no intention of returning Lestat's vampire body to him. Louis begged Lestat to see reason before he even made the switch. But this is Lestat. Since when did common sense nor reason factor into anything? So he's left chasing the most powerful vampire alive in this world, trapped in the weak and mortal shell of a human being. Not his finest hour. Set includes: Interview with the Vampire, The Vampire Lestat, The Queen of the Damned, and The Tale of the Body Thief. I'd love it to be Stuart Townsend again. I think he nailed the part completely. It'd be interesting to know who plays Lestat! I'm really looking forward to it too! Though I do worry about the usual troubles beforehand. The fandom generally finds something to kick off about with these movies. I so want to see it!! Great article! Why Do We Fear Vampires? It's one of the classic vampire movies of all time. The dramatization of the first in Anne Rice's 'The Vampire Chronicles' series set the standard. The legends go back even further than you may think. They are one of the most enduring monsters in our world. So what makes us so afraid of vampires?